A customer experience glass exists for your organization or association. How would your customers or members describe it? Most groups I speak to rely on a traditional 5-point customer satisfaction rating scale to keep them going in the right direction. Yet, as a planning tool, this scale falls short of delivering the insight and direction required not only for business growth. But also to drive internal stakeholder success and customer retention. For starters, the 5-point rating scale lacks breadth and depth: it has no volume. Not like the volume of water contained in how your clients would describe your customer experience glass. When the customer experience glass remains at half capacity, you miss essential ingredients in delivering on customer expectations. A company can hum along in blissful workforce busy-ness. Yet, the business model keeps employees in departmental silos. Then, hiring models marginalize employees based on pay scale, job title and level of education. When this scenario happens, the workforce lacks the critical ingredient of inclusion. The type of inclusion responsible for filling up not only the customer experience glass. But also the employee experience glass. He told me he loves to bring in consultants. Because, in his mind, consultants make him look powerful in the eyes of employees. However, once consultants depart, their work is not sustainable. Because, he realizes, his “leadership by example” style creates a company culture of people “acting” their roles. Instead of understanding the why and how involved in doing their jobs. His employees are not certain about the functional outcomes of their “acting busy and looking the part.” As a result, output is poor. When you do not mix the ingredients essential to delivering on customer expectations, the customer experience glass remains at half capacity. At best. The CEO realized that every consultant he hired ended up delivering just what the CEO wanted: a business model at half the capacity of what is needed. This model puts employees into functional slots in tidy departments. Nobody mixes with anyone else outside of their department. Because employees are not encouraged to discover what other employees do, functionally, mistakes are made. The type of mistakes that negatively impact revenue and customer retention. And, the CEO is comfortable playing a figurehead role. Instead of serving as an essential ingredient for retaining customers and employees. Consequently, business growth is a roller coaster ride, from year to year. I suggested he place a glass of water on his desk each day, filled at half the capacity of What is Possible. And, at the end of each day, decide on whether his actions had filled the glass closer to capacity, or not. Then, before he hired one more consultant, share a glass of water with a customer or two. And compare notes. When we spoke several weeks later, what news do you think he told me? 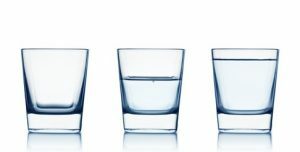 Ready to fill up your customer experience glass? Take the next steps!